Walter D. Mignolo is William H. Wannamaker Distinguished Professor and Director of the Center for Global Studies and the Humanities at Duke University. He has been working for the past 25 years on the formation and transformation of the modern/colonial world system and on the idea of Western Civilization. Among his major works are The Darker Side of The Renaissance: Literacy, Territoriality and Colonization (1995), which received the Katherine Singer Kovacs Prize from the Modern Languages Association of America in 1996. The book is now being translated into Chinese. Local Histories / Global Designs: Coloniality, Subaltern Knowledge and Border Thinking (2000) was translated into Spanish and Portuguese and now is being translated into Korean. The Idea of Latin America (2005) received the Frantz Fanon Award from the Caribbean Philosophical Association in 2006, and has been translated into Spanish, Korean and Italian. His most recent book, The Darker Side of Western Modernity: Global Futures, Decolonial Options was released in December of 2011. 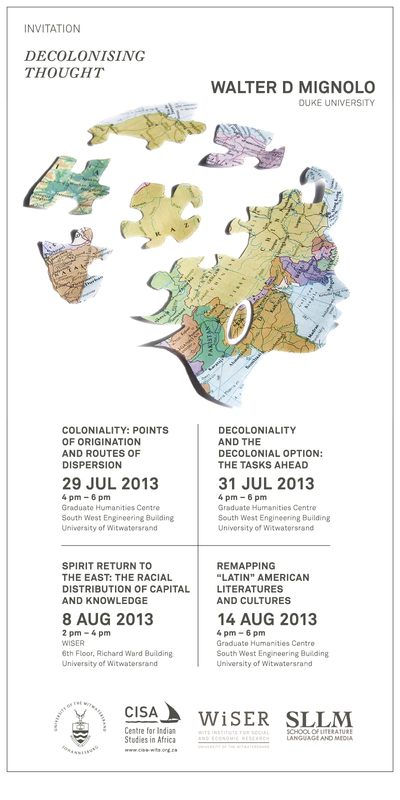 Professor Mignolo holds an Associate Research Position at the Universidad Andina Simón Bolívar in Quito and he has co-organized, with Rolando Vazquez, summer schools on “coloniality and decoloniality” at the Roosevelt Academy of the University of Utrecht at Middleburgh, the Netherlands. He is a member of numerous international advisory boards, including the advisory board of the Hong Kong Advanced Institute for Cross-Disciplinary Studies. Currently, Professor Mignolo is also advising an Argentinian documentary filmmaker on a project concerning “modernity / coloniality / decoloniality” — a school of thought that originated in South America and the Caribbean among several prominent thinkers including Professor Mignolo himself.